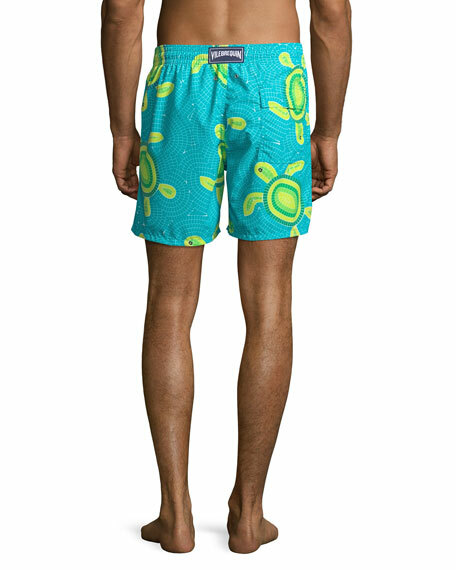 Vilebrequin swim trunks in mosaic turtle print. Side slip pockets; back flap pocket. Rear eyelets for air evacuation. Model's measurements: Height 6'1"/185cm, waist 32"/81cm, typically wears size M.
Founded in Saint-Tropez in 1971, Vilebrequin has become the nec plus ultra in men's swimwear. The original vivid "Moorea" trunks were made from spinnaker canvas, which dried more quickly than traditional trunks of the time. The name is from the French word for crankshaft, an homage to the founder's fondness for automobiles. Today's vibrantly printed collection, though made from modern fabrics, still carries the French firm's tradition of savoir faire. Orlebar Brown "Bulldog" solid sport shorts. Can go from the water to the weights, sport to swim. Side slash pockets; back zip pocket. Tailored fit. Hem hits above knee. Snap/zip fly. Nylon/polyurethane. Imported. Model's measurements: Height 6'1"/185cm, waist 32"/81cm, typically wears size M.
Peter Millar swim shorts with floral print. Approx. 18.5" inseam. Side slip pockets; back button flap pocket. Button/zip fly; elastic waistband Polyester. Machine wash. Imported. 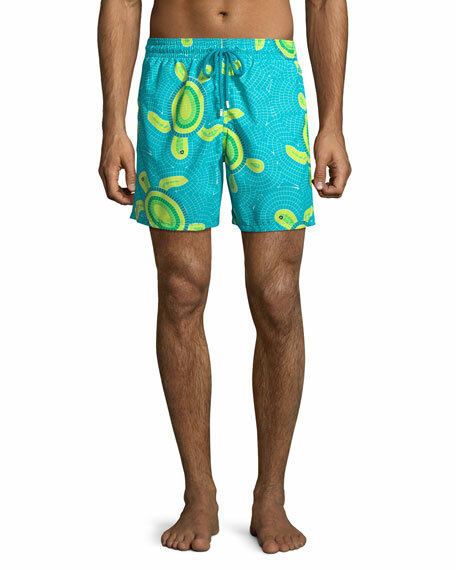 Peter Millar swim trunks in reptile graphic print detail. Drawstring elastic waistband. Side slip pockets; back patch pocket. Hem ends slightly above hem. Polyester. Imported. Model's measurements: Height 6'1"/185cm, waist 32"/81cm, typically wears size M.
Thom Browne board shorts in brushed finished swim tech. Drawstring with elastic waistband. Side slip pockets; back flap pocket. Hem ends slightly above knee. Pull-on style. Nylon. Made in Italy.